They told the News Agency of Nigeria(NAN) in a separate interview that the president’s action was worthy of commendation. NAN reports that the Federal Government on Wednesday also conferred the highest honor of the country, Grand Commander of Federal Republic(GCFR) posthumously on MKO Abiola, the presumed winner of the June 12, 1993, presidential election. Also honored are Abiola’s running mate in the election, Alhaji Babagana Kingibe, who would receive GCON, while late human rights lawyer, Chief Gani Fawehinmi, bagged GCON posthumously. A political scientist, Dr Gbade Ojo, described the declaration by the presidency as a watershed for the course of governance and democratic development in Nigeria. Ojo, who is the Chief of Staff to Gov. Abiola Ajimobi of Oyo State, said June 12 represented the genuine aspirations of the people. “Any system that does not have a reward mechanism is doomed to fail. Ideals of democracy allow for conferment of honors on those deserving, even in death,” he said. He also agreed with the position of a former Chief Judge of Nigeria, Justice Alfa Belgore, that the declaration was faulty on legal grounds with reference to the 1963 National Honours Act. He urged the Federal Government to do more by officially recognizing Abiola as a former president and accord him and his family all entitlements in that regard. Similarly, Dr Morounkola Thomas, Executive Assistant to Gov. Ajimobi on Political Matters, commended Buhari and his cabinet for taking such a decision. “It is unfortunate that former President Olusegun Obasanjo, a major beneficiary of the struggle failed to do that. What Buhari has done is to put the record straight. “This is a shame on the enemies of democracy. I must commend Buhari for this feat. He has given recognition to a man that put his life on the line for the enthronement of democracy. “He has given recognition to a man that fought tooth and nail for the poor and the country. “To us as a party and government, this is a welcome development. It is in tandem with the wishes and aspirations of our people,” he said. Thomas called on the president to go further in declaring Abiola as a duly elected winner of the June 12, 1993, presidential election. He also urged Belgore to take the matter to court if he was not satisfied, adding that Buhari had taken the matter to the court of the people. “It is a pity that our learned father has said such, there is nothing illegal about the declaration. 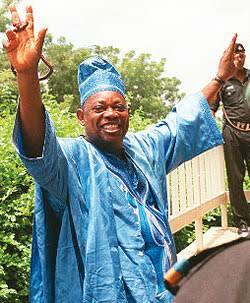 “ Abiola’s election is legal, politically correct and acceptable by the people.